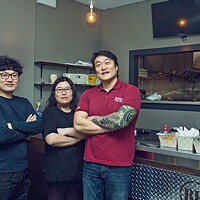 Friends Sang Ho Back and JoungMin Kim are the brains behind tiny culinary gem Backoos Korean Food. "There aren't a lot of Koreans here," JoungMin Kim says. "So when you see one another you're like 'Korean? Korean! Hey!' It's a small community." Kim met Sang Ho Back two years ago, just after moving to Nova Scotia with his wife and kids. "My wife, she's from here and she wanted to live back home," he says. They met while she was teaching in Korea, after Kim had lived on Canada's west coast for awhile. "We decided to give it a try. It's been a little more than two years now. I'm still getting used to it." It was a grocery store aisle where Kim ran into Back. 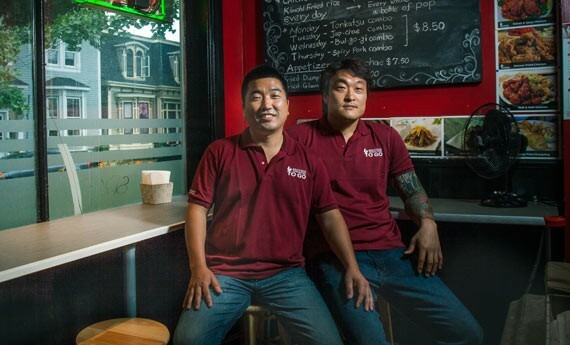 After their chance meeting, the two became friends, and, after thinking about what possibilities there were for them in Nova Scotia, they opened Backoo's Korean Food ToGo with another partner, Jae Gwon Koo. "In Korea there were some difficulties, we came here for a better life," says Back, who moved to Halifax in 2008, with his wife and two children and his niece and nephew—now college and high school age—who came into his care after their parents passed away in an accident. "Canada is good, it has opportunities. There is good education for the kids," he says. He added a another child to his family once they were settled. "My third kid was made in Canada," he says, laughing. Four years ago, while working at a convenience store, Back started looking for a place to open a restaurant. 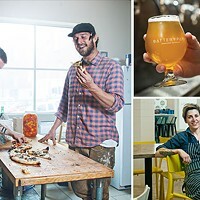 Last year, with Kim and Koo, he found a location—an old take-out pizza location that could easily be refit as a fried chicken outfit: "We made the company in October, and then opened on Birmingham Street in December, and the second shop in Bedford we opened in June." The downtown restaurant is tiny, a slip of a counter with a one-hand finger-count of stools that makes up a seating area. It smells good, the earthy spice of gochujang and warm oil permeating the air. The burbling of hot oil and the splash of chicken orders as they are submerged fills any empty space left by the Asian pop music that plays on a small wall-mounted television. Korean fried chicken, often called "the other KFC" is insanely popular in South Korea. It's a multi-billion dollar business with its own slang name, chimaek, a portmanteau of chicken and maekju, Korean for beer. "Here in Halifax you go out for beer and chicken wings," says Kim. "In Korea you get a whole chicken with different flavours. And that's what we're trying to bring here." "Here there has only been KFC," Back says of the Colonel's secretly spiced chicken. "I tried it: it's very salty, very oily. Korean chicken is very different. It looks similar, but the taste is very different and it's cooked in a way that is also very different." The restaurant only uses fresh chicken, never frozen. It's marinated overnight— Korean chicken often uses ingredients like soy and sake for marinades, giving a slight hum of flavour that differs from Southern fried chicken—and then fried up to order the next day. 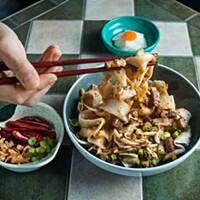 The chicken is twice-fried, giving each piece papery thin, crackling skin that can either be enjoyed on its own, or coated in an assortment of sauces. "Korean food is not fast food. It takes a long time. A long time," Back says, laughing. In Korea, chimaek comes in may forms, topped in many ways: Honey, soy sauce, sweet and spicy chili sauce, curry powder, green onions, leeks. Backoos is keeping it simple by offering two different sauces. "We have a spicy and sweet and we have a soy garlic," says Kim. The spicy and sweet sauce is perhaps the most familiar sauces to casual fans of Korean fried chicken, a yangnyeom sauce, made with gochujang, a Korean red chili pepper paste, garlic, ginger and honey. It's not overly sweet, the dark sugary note just a caramel accent to the earthy tang and kimchi-like flush of the chili paste. 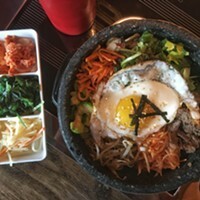 "I was a little bit concerned at first that it people might find it too spicy with the gochujang, but surprisingly a lot of people say it's not too spicy." The original customers, Kim says, were a mix of Korean and Chinese people, students, young people and young couples that live downtown. "The downtown store is doing well with international students. Our western audience is growing, though," he says. "They find it interesting and also tasty. And I think we have found flavours that will appeal to everyone. Hopefully by the end of the year we'll find a balance between the two stores and actually make money." Right now, Kim and Back are holding down almost all of the duties in the two locations. Kim shrugs as he says he works 11 hours a day, doing everything from cooking to cleaning. "It's building time right now," he says. "The restaurant still isn't known yet," says Kim. "Right now people are still like 'Oh, I found you!' I hope by the end of the year it will be more known to people." "We sure hope!" says Back, as the two share a laugh. "If it gets bigger, maybe we can hire somebody!" One of their other hopes is to eventually expand into a space where people can relax and sit down. It's certainly not lost on Back and Kim that it would be easier if they could embrace the entire chimaek concept and offer a beer with the chicken. "Alcohol lets people loosen up a bit and then they are open to trying new things," says Kim. "The only thing we have right now is the food—the taste—and the hope that people will come and find it and try it again and again. I hope we can build on that in the future. Right now we're just trying to hang on." Comforting sweetness and addictive heat make Gangnam Korean BBQ’s flavour unforgettable.